There’s a fantastic lesson on projectiles hidden here. Just the fact that the ball is more solid towards the top of the image shows that it’s slowing down and there’s all sorts of speed calculations possible if you know that the image was taken over 0.04s. So you can see why I couldn’t dislodge this picture once it got a clawhold in my head. The ball is actually falling, though, and was dropped, more to the point of the problem. OK. So the ball was moving more slowly at the top, but not because it was slowing down on the way up, because it was speeding up on its way down. Starting with Alby’s ideas, you could examine the image and pretty closely estimate the distance traveled in 1/25s to find the average velocity of the ball over the “blur.” Velocity at the top would be 0 regardless, but the average velocity would need a + or – depending on whether it’s moving up or down. Bring in some kinematics and you could calculate the velocity at the bottom. Thanks to Dan tipping his hand, we know it’s vf at the bottom and vi at the top, but what if we didn’t know? Would it make a difference if we let the bottom be vi and the top be vf? For Algebra, explore the symmetry of the parabola on a height vs. time graph – why would the picture look the same regardless of which side of the vertex we were on? Bust some Calculus and do some differentiation to look at the instantaneous velocity at any point. Bring in vectors to talk about what makes things “slow down” (a and v pointing in opposite directions) or “speed up” (a and v pointing the same way). Lots of good physics-y stuff here. 1. Hide the EXIF data and calculate the exposure time. 2. 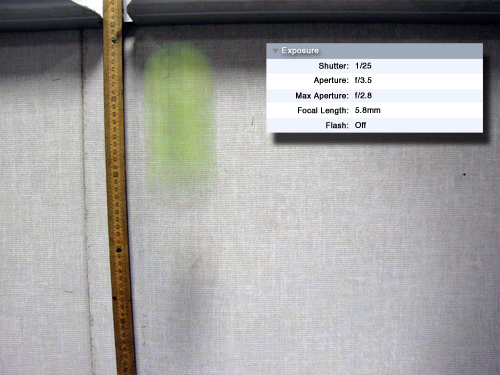 Calculate time before impact with the ground (though you wouldn’t need the blur for that). 3. Calculate acceleration due to gravity (since you can figure out the distance the ball has traveled in the specified time). 4. Calculate how long the blur of the ball would be if the shutter was opened after the ball had already fallen 50cm. Then, if you’re really tricky, take that picture and compare how accurate your calculations were. 5. 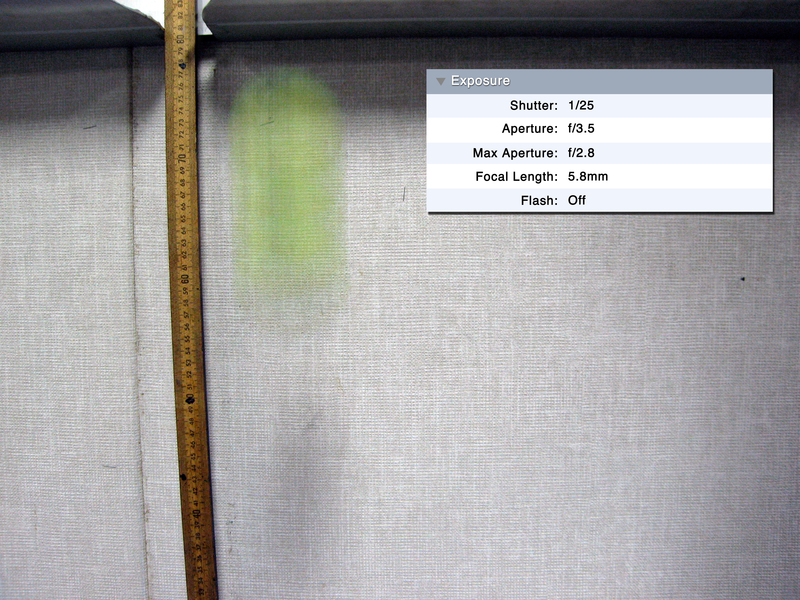 Similar to above, you could calculate how long the blur of the ball would be if you used different shutter speeds. 6. You could do some stuff with the optics (focal length, etc. ), but I think there would be more effective ways to get at that. 7. Have them figure out the setup to even get this shot. My guess is it involved a tripod and a remote shutter button, but the ball (assuming it was touching the ledge originally) appears to only have fallen about 2-3 cm when the shutter was opened. This means if you dropped it by hand you got your hand out of there pretty dern quick. I’m guessing there must’ve been some other way to release the ball. I think I’d have them preform various calculations and them give them a tennis ball and see if they can verify their calculations experimentally. Scott, nice. Good stuff. Now here’s the thing that excites me lately. I’m past the point of training my eyes to correlate interesting images & video to math standards. I’ve got that. Where I’m at now is, once I experience that initial spark, how do I develop it into a list of possible lessons, something taught and assessed, and then how do I select the ideal lesson from that list? You’ve tossed out lesson ideas across the high school math spectrum. How do we now decide which of your lesson prompts has the most potential? How do we then develop it? I feel close to some kind of grand unification theory for math curriculum design. 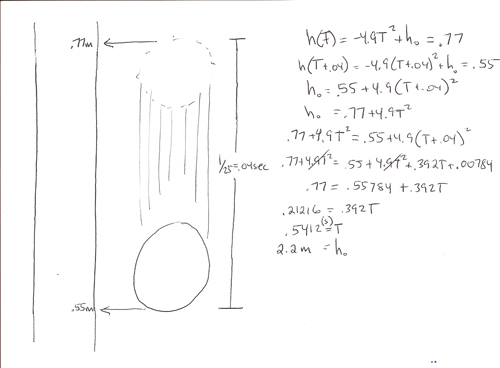 re #1: without knowing the height from which the ball was dropped, how do you calculate exposure time? I could’ve dropped the ball from a ladder with a very fast shutter speed to match or from right above the meter stick with a slower shutter speed. likewise #2: without the blur, how do you know if the ball was dropped from a mile in the air (and is consequently moving very very quickly) or from a inch above its current position (and is only just picking up speed)? I like #5, though I can say from experience that reproducing the estimate with a camera, tripod, and tennis ball would be very, very difficult. re #1: I was making an assumption (which in viewing the picture more critically was obviously erroneous) that the tennis ball was dropped from the top of the meter stick. You would need the initial height to figure this one out. #2: Again, this was based on the assumption that you knew the height of the release. However, with the blur, this is a nice three-stepper (at least the way I calculated it). According to my rough measurements, you dropped the ball from a height of about 2.75 m (just about 9 ft.). Is it fair to guess the room where this picture is taken has 9 foot ceilings? Maybe there’s a little CIA in this lesson as well. You hear about experts who look closely at photos and video to determine the location of individuals (I’m thinking along the lines of bin Laden, kidnappers, etc.) based upon subtle clues in the recording. For example, I’d bet you took this picture at school? Schools tend to have taller ceilings than the standard 8 ft. residential ceiling. Or perhaps your residence simply has cathedral ceilings. Not sure if this tangent is too applicable to a math-specific class. I certainly see where it could fit into a forensic science class. My first thought seeing the picture was “Time Warp“! Most of it consists of filming things with expensive cameras that look cool when you slow them way down. Then they spend 10 seconds on a token physics lesson, then they show more cool stuff. Kind of like Mythbusters or Good Eats, I’m always looking for excuses to incorporate clips into class. I’d give them the height of the drop and have them calculate the exposure time. The for extension have them graph exposure time vs height to achieve the same length of blur. Sorry that this is an unrelated comment, but I’m just getting started with a teaching blog of my own. As part of my learning process, I’ve been advised to “audit” some well-written blogs, and I chose yours as my first audit. Your site is recommended on my blog, and I’d love to have you take a look at it and comment with your thoughts on my page at your convenience. That’s the hard part, indeed. Ooh ooh! Introduce (spontaneous) symmetry breaking! You can’t tell whether the ball is rising or falling so it’s symmetric in time. I’m most interested in the fact that the amount of exposure the ball had was longer at the top than the bottom (giving a visible effect) because the the acceleration changed the velocity. FYI to the commenters here: I added a summary judgment to the post itself. Thanks for the ideas, everyone. It must be a middle school math thing.